Kevin Hardcastle is not associated with the SnowBall Registry. The Snowball line of Feist were bred up here in the Ozark Mountains. They have been used on all tree game here in the Ozark Mountains. Most are outstanding tree dogs. They are bred to run track with their heads up. Run to catch, when they bark, they have the game. They start early, hunt hard, tree hard and are extra fast locators. They have loud clean chop mouths. They use everything they have: Eyes, Ears and Nose. They come any color, 15 to 17 inches tall, 20 to 26 pounds. Outstanding looks, short hair. Some come Bobtail. Some come with perked ears others break over at tip. No long ears. 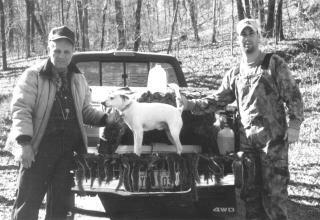 The Snowball Feist Registry was formed by Earl Wilkerson and Kevin Hardcastle in July 2001. "The Registry" e-mail address or phone number for a application. Their has been many people selling pups that say they are SnowBall Feists. Please make sure they are Registered into the SnowBall Feist Registry before you buy. Buyer Beware: If you are buying a SnowBall Feist and it is not registered in the SnowBall Feist Registry than it is NOT a SnowBall Feist. It's just a feist that may look like a SnowBall Feist. before each dog can be registered.